Painter and printmaker Mary Evelyn Wrinch (1877-1969) was an active member of the visual arts community in Toronto in the early 20th century. 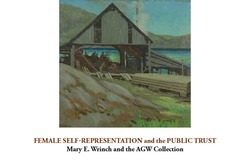 This exhibition features paintings and lino block prints, with subject matter that includes landscapes and industrial activity in Muskoka as well as floral imagery developed in response to her gardens in Wychwood Park, Toronto where she lived for many decades alone and with her husband, artist George A. Reid. The exhibition shows her to be an accomplished artist and important printmaker, and traces the formation of the collection of her work at the AGW.